Planning a wedding is a big task. But if you’re lucky, you have the best girlfriends by your side helping you through each step. 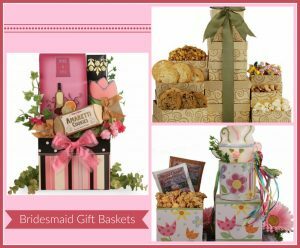 Thank them for keeping you sane through the process (and life) with one of our bridesmaid gift baskets. With one of these, it’ll be a big day for them too! Simple Pleasures of Coffee – Being a bridesmaid can be tiring – so many decorations, so little time. Help your bridal party stay energized and thank them for their tireless work with this gift tower. We have everything you need to enjoy your cup of joe: a whimsical mug, some delicious coffee, a little something to nosh on, and a good book. Cosmopolitan Gift – It’s finally the day you all have been waiting for – the bachelorette party! Giving your favorite girls one of these packages gives you a fun and yummy activity to do on your big night. Mix in your choice of alcohol with the delicious Cosmorita included, blend, and relax with the lovely ladies surrounding you. Go for the Gold Gift Tower – Don’t settle for an average gift for your bridal party – go for the gold! They’re your best friends and they’ve helped you through this process, so they deserve something nice and shiny. This gift tower includes a little bit of everything from sweets to treats to meats – all the great things your bridesmaids could hope for. 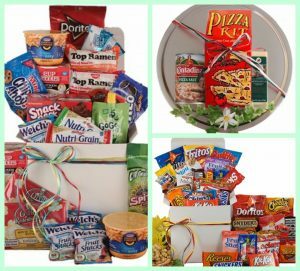 If one of these isn’t the perfect way to thank your friends, we have plenty more to choose from at BisketBaskets.com!